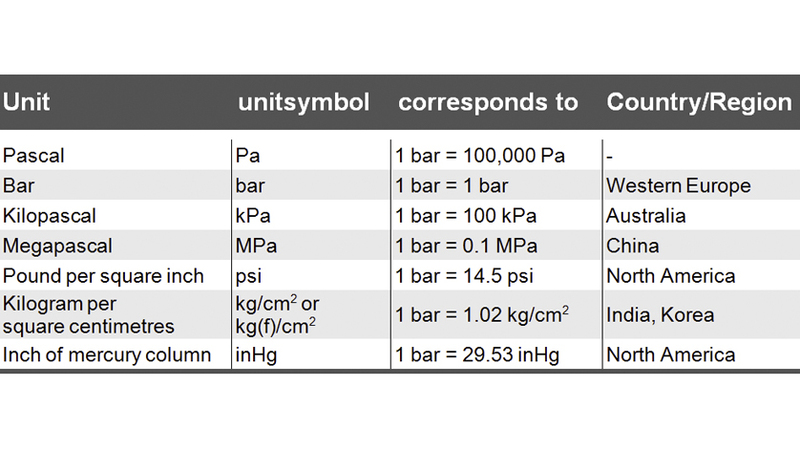 You must have already asked yourself once in a while why there are so many different pressure units worldwide: when are they used and which units are used most frequently and where? These questions can be answered quite easily: the SI unit for the physical quantity “pressure” established many years ago (and in many countries prescribed by law) is the “Pascal (Pa)”. However, in pressure measurement, the Pascal is hardly used despite that, and instead typically the (also permitted) “bar” is used. Which is quite understandable, given the fact that for most technical applications 1 Pascal is far too small for practical use. Example: A normal domestic water main is operated at 400,000 – 600,000 Pa (4 – 6 bar ). This means that even at relatively small pressures the “figures” become already quite large and unmanageable. This is why in Western Europe the SI-compliant unit bar is the most widely used unit. In contrast, in Australia and China the units “kilo-Pascal (kPa)” and “mega-Pascal (MPa)” have become established. In North America, the preferred pressure unit is “psi (pounds per square inch)”. In many Asian countries, such as India and Korea, the unit “kilogram per square centimetre (kg/cm²)” is found quite often. To make use of the WIKA pressure sensors as simple as possible in many regions and to be guided by the customs and preferences of the local users, WIKA pressure sensors are usually offered in almost all internationally customary units.